Yes, you can watch the Monaco Grand Prix from the hillside if you don't mind being a little uncomfortable. This is below le Rocher. As you can see, a great view as the drivers negotiate Rascasse or pull into the Pit Lane. I thought this was a free area until Ed corrected me. Apparently it costs around 70 euros to sit here. Thanks Ed. Once again, apologies for lack of good photographs - it was a muggy ol' day and this was taken from a great distance. 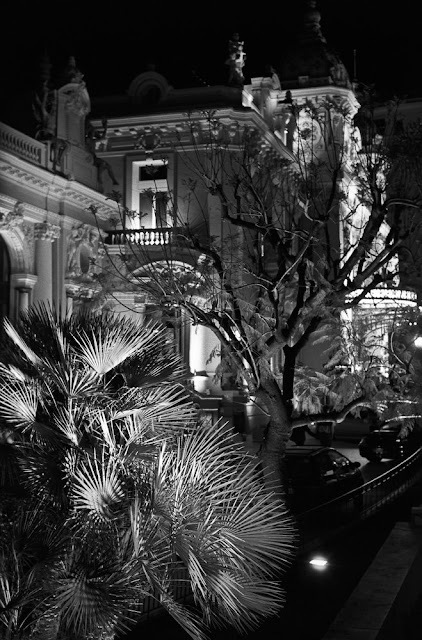 Here's a few zooms onto the Automobile Club of Monaco's extension. A bit grainy - I was a long way away. The girl in the red cap is one of several working there - all dressed the same. In the last photo, note the glass of champagne on the rail - hope he doesn't knock it off! The structure (you see all of it in the smaller photograph) is the Automobile Club of Monaco's extension. This is put up each year for members of the ACM to watch the race but is also available for visiting ex-racing drivers and presumably for anyone who is lucky enough to have been given a ticket. We'll see a little more of this tomorrow. You can watch the Grand Prix from so many different places. Here's the first - from one of the many stands. Tomorrow: More ways to watch the Grand Prix. Crowds - you can't avoid them in Monaco at Grand Prix time. This was taken on Thursday practice day so you can be sure by Sunday - race day - you'd hardly be able to move. All part of the fun as the excitement builds. Here we are in the pedestrian street, Rue Princesse Caroline, looking towards Port Hercule. Alright I know these are very small figures but you can just see Lewis Hamilton walking in between the dotted lines. I was an awful long way away. If you watched the race you'll remember that Jenson Button parked his car in the pit lane in error and then had to run all the way along the road in front of the port to the Start/Finish line and Prince Albert. Well I took this from that distance - ie the Start/Finish line - so my little Lumix did pretty well. In the smaller photo you see the Pit Lane, bottom right with people walking on it. Opposite is one of the stands with an enormous screen at the end showing the race. Behind some of the smaller boats. (This photograph was taken on Thursday during the Practice session). If there is one thing you must have at the Monaco Grand Prix, it's ear protection. Forget cotton wool, wax shapes for your ears, you need noise cancelling headphones and the more you pay the better they will be. You can pay around US$250 for a pair made by BOSE and they'll be good. You will pay 45 euros for these and they include listening to the race on the radio. You can buy even cheaper - see the last photo. The salesman of the Race Radio headphones told me that it's mandatory to have hearing protection at 110 decibels and that the noise of Formula One cars is 130 decibels. A gun shot is 140. Believe me, he's right, I had no protection on Practice Day on Thursday and suffered for it. The main photo shows Jenson Button negotiating the chicane before the swimming pool. In the smaller photo (lower right) you can see this chicane in relation to the left-hand side of Port Hercule. You can see the swimming pool in the posting of two days ago. Jenson Button lives in Monaco, so home turf for him. (These pics were taking during the Thursday practice session). There are 33 kilometres of safety barriers in place, 20,000 sq. metres of wire fencing, 5000 protection tyres, 500 fire extinquishers (1 every 15 metres), 32 surveillance cameras + 7 mobile ones. And then there are 1100 tons of stands, 900 tons of Boxes. There are 650 marshals, 120 professional firefighters, 30 reanimation doctors, 40 doctors (30 on the circuit and 10 for the spectators) 46 nurses (30 on the circuit and 16 for the spectators) 250 paramedics (80 on the track and 170 for the spectators). There are 7 rapid-response fire engines, 3 vehicles for extraction and extrication, 3 service vehicles, 40 ambulances, 2 boats, 2 helicopters, 60 race organisation vehicles. In the smaller photo, you see a Ferrari. I don't know if it's driven by Felipe Massa or Kimi Raikkonen but I think it's the latter - and if so, then Pasi from Finland will be pleased! We've entered the Palais Heracles by handing our pass (see yesterday's post) to these friendly ladies. Now we are up on the 11th floor and this is the view directly ahead showing the part of the track that goes around the swimming pool. A hazy day and very humid. If we look to the left we see the hill going up to Casino Square and the track coming back thru the tunnel. To the right, the pit lane. (We'll see all this another day). Nice-Matin reports there is a 50% drop in bookings for the Monaco Grand Prix this year. Many people who have an apartment overlooking the track rent out their balconies for a goodly sum. This year bookings are drastically reduced due, of course, to the world's recession. The same is true of tickets for the many stands around the track - I gather prices are being reduced to encourage more visitors. Each year in Monaco, just before the four days of Grand Prix activities, the Principality holds a football match in aid of charity. One team is made up of a group of well-known personalities in the world of sport (Star Team) and one team consists of Formula One drivers. Prince Albert, who is a keen sportsman, captained the Star Team. The result: 5-2 to the Formula One drivers. During the four days of the Monaco Grand Prix: Thursday's Practice session, Qualifying on Saturday and of course the Grand Prix itself on Sunday - if you live anywhere with access to the track then you need a pass to enter your apartment building. Trains and buses are the only sensible ways to get into Monaco on race days. Today the track will be closed from 07.00h to 18.30h and in Monaco, when the Grand Prix track is closed, Monaco is closed. Lucky me has a friend whose mother lives on the 11th floor of the Palais Heracles which is bang over the Start/Finish line of the Grand Prix track - in front of Port Hercule - and today I'm invited onto the balcony for lunch and to take photographs. Come back tomorrow and see if I got a shot of Jensen Button. Don't count on it - I think he might be going too fast! The Salle Empire is a stunningly beautiful banqueting room in the Hôtel de Paris, used, as you see here, for functions. The terrace overlooks the Place du Casino. I think these guests were rather enjoying being looked at and photographed by the crowd outside. Perhaps a British gathering as I thought I heard a few Brit accents. 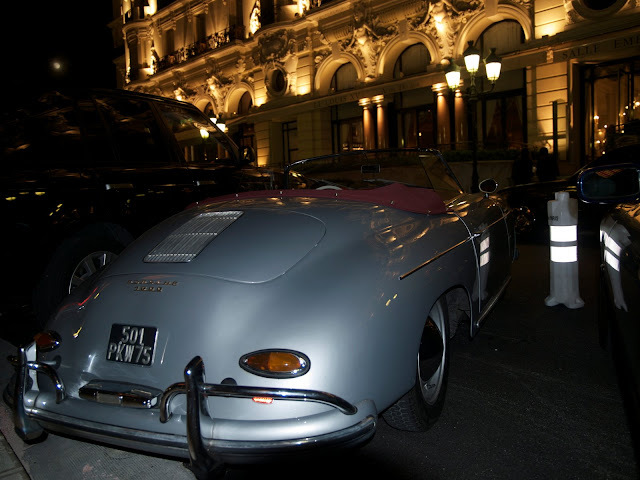 A older Porsche outside the Hôtel de Paris, photographed by Chuckeroon. It's great fun to come to Casino Square, any time of the day or evening and look at the cars. This is the last in this particular 'Guest Photographer' series on Monte Carlo Daily Photo - after all, we were only in Monaco for one evening and most of that was spent eating and drinking! - but it continues on Menton Daily Photo. Thanks so much to Nathalie, Peter, Richard and Chuckeroon for sharing their favourite photographs. I learned so much watching these talented photographers at work but I learned even more when their photographs arrived. Just fascinating to see how differently each sees a particular scene. All so different, all so brilliant. Thanks, guys. Come back soon! 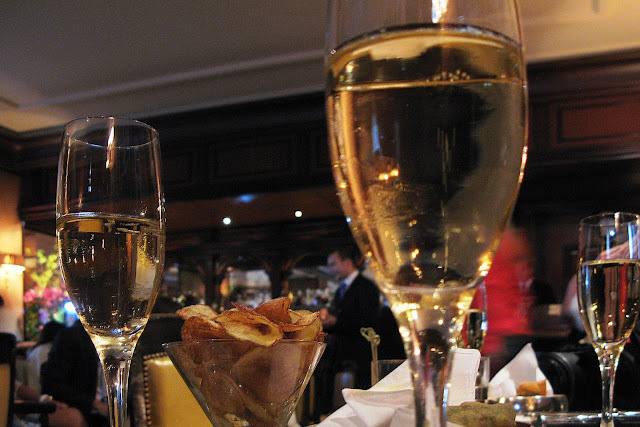 Champagne in the American Bar of the Hôtel de Paris by Peter. We saw Richard's B & W version a few days ago. (Please click on the link) Again, it's so fascinating to see how different photographers approach the same subject. 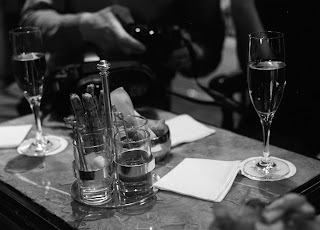 Personally, I'm happy to see champagne photographed ad infinitum - so long as I'm there to drink it! 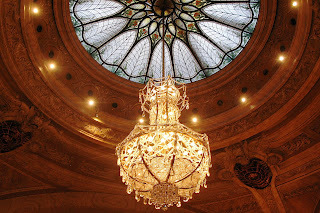 In the smaller photographer you see Peter's shot of the ceiling in the foyer and its beautiful chandelier. 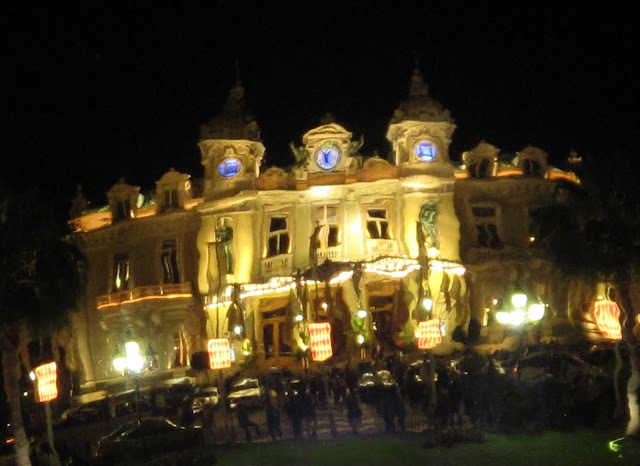 Nathalie took this photograph on an earlier trip to Menton and Monte Carlo - in February. Dark skies show off the beautiful wrought-iron lamps of the Casino. Crowds, lights, cameras - the Casino at night by Chuckeroon. To enter the Casino you must produce your passport - a photocopy is taken. 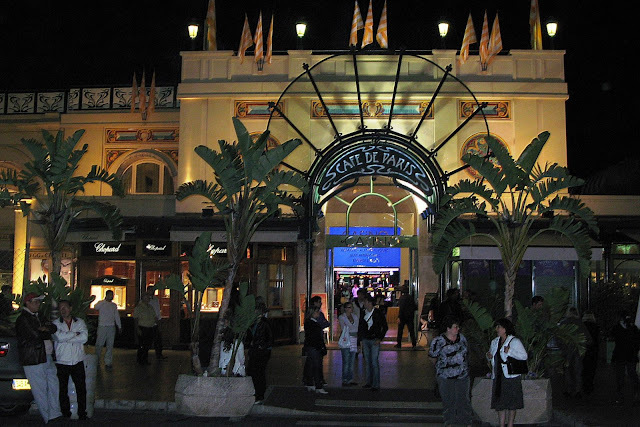 However, if you are a Monaco citizen, you are never ever allowed to enter the casino. A Monaco resident - yes. A Monegasque citizen - no. 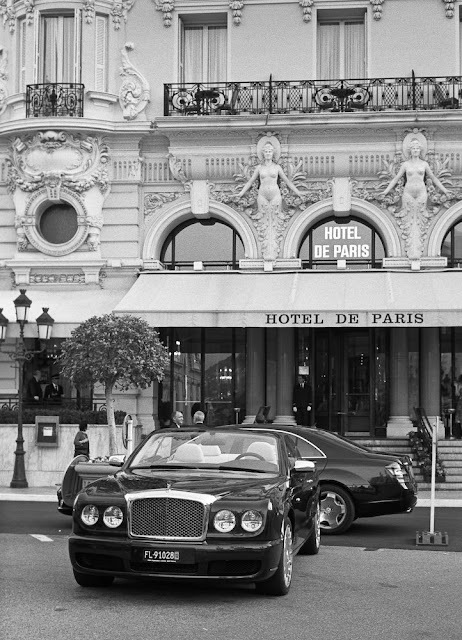 The Café de Paris is on the opposite side of Casino Square to the Hôtel de Paris that we saw yesterday. In this photograph by Peter of Paris, we are looking at the entrance - straight ahead are slot machines but we turned right and dined in the beautiful restaurant decorated in the Art Nouveau style. You can see one of the beautiful screens by clicking on the link. Peter has created a wonderful montage and reportage of his time in Menton - do click on his link to take a look. If it's Black and White, it must be Richard from Zurich. 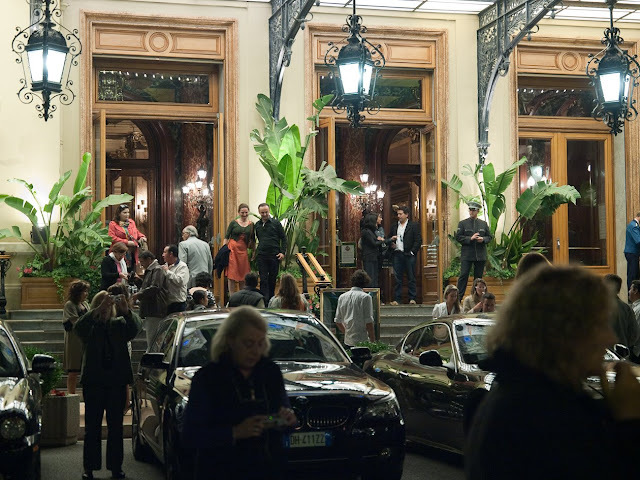 The Hôtel de Paris, which is where we five Bloggers started our evening in Monte Carlo. Champagne in the American Bar, which is on the left as you enter the hotel. We drank Pommery poured at the table from a Magnum. What has been so fascinating to me is how, as photographers, we all see the same thing differently. Over the next days, we'll be seeing more shots of our time in Monte Carlo. Do click on the link to Richard's blog where you'll find yourself in the medieval village of Roquebrune. Last weekend, four fabulous blogger/photographers came to stay in Menton: Richard from Zurich, Nathalie from Avignon, Chuckeroon from Richmond-upon-Thames and Peter from Paris. To see them climbing Roquebrune's famous 2000 year old olive tree, please click on the link. From today on Monte Carlo Daily Photo and from tomorrow on Menton Daily Photo - and for the next couple of weeks - you'll be able to see photographs of Monte Carlo and Menton through the eyes of these talented photographers. Today, we see Nathalie's photograph of the Casino - a reflection in Sky Mirror, by the British (Mumbai-born) artist, Anish Kapoor. Fabrizio from Turin was to have been here too but sadly, at the last minute, he couldn't make it. We missed you, Fabrizio and do hope you can make it on another occasion. There's a new net this year. Last year, there were two - one on each side of the central breakwater. This year we have only one and it stretches right across the beach. According to Nice-Matin this is a better and much safer net that the one we had before. You can see a diver in the smaller photograph inspecting the nets before the day begins. I don't know what the person in the background is doing - holding up a something green. A mystery? A shot of Larvotto Beach with the sun beds of La Spiaggia in the foreground. Only 9.30h when I took this - soon it will be full of near naked bodies taking the sun. You can see the line of the jellyfish net on the sea. Tomorrow we'll take a closer look at this. Orchids in a pot at La Spiaggia. Somehow you don't expect to see orchids on the beach but this is Monte Carlo after all. Aren't the pots pretty? This is one of a series of sculptures by Philippe Pastor called 'Les Arbres Brûlés' - Burned Trees. You see the full sculpture in the smaller photograph. Philippe Pastor is a Monegasque sculptor. You can see more in the Burned Trees series HERE when they were exhibited last year in the Casino Gardens. All the sculptures in this series were created using scorched tree trunks from the Garde Freinet Forest, near to St. Tropez along the coast from Monaco. It was devastated by fire in the summer of 2003. They bear witness to the artist's intention to make the public aware of the fragility of the environment and the necessity of protecting it. This weird looking plant is called a Crested Saguaro. However, to see an amazing version of this plant, complete with holes for the birds that nest in it (!) we need to go all the way to Arizona. Click on Julie's Scottsdale Daily Photo for a great photo and information on the plant too.